This spicy chicken curry is one of the many Indian chicken curry recipes. In fact there are no limited ways of preparing a chicken curry. Indian recipes with chicken can be as varied as the variety of fish in the ocean (even if this is an exaggeration, there is still a high percentage of truth in this statement). You can just mix and match the combination of spices and wet ingredients, to get each curry to taste different. This curry will taste very different from the rest of the curries already given under chicken recipes. This is not exactly like chicken chili (this is not dry) but the addition of one capsicum (bell pepper), imparts a very nice flavor to this recipe. Marinate the chicken for 2 hours in the marinade. Take the ingredients under dry masala powder and dry roast (no oil) them in a heavy bottom pan until they change color and impart a nice aroma. To dry roast heat a heavy bottom pan, then reduce the flame and pour these spices in the pan. Stir continuously for even roasting. The heat should be very low otherwise the spices will get burnt and become bitter. Let them cool down to room temperature and then grind into fine powder. Keep aside. Saute the onions in butter until soft and glassy. Keep aside. Now, heat the oil in a kadai or a wide mouth cooking pot, add all the chicken along with the marinade. Cook on a high flame till all the chicken appears sealed and roasted. At this stage add the tomatoes, onions, ketchup and soy. If the chicken is tender then keep cooking without the lid or if it is tough then cover and cook till almost done. Keep stirring in between. Now add the capsicum and the masala powder, cook for 5 more minutes. To improve the consistency of the gravy add some hot water if needed. You can make this recipe as a curry i.e thin with gravy or sauce by adding water. You can also make as a dry chicken, for that just let the water from the chicken evaporate during cooking and add no water later on. 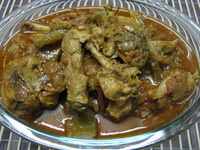 Serve hot with boiled rice or chapati and enjoy this spicy chicken curry.